A frame within a frame. 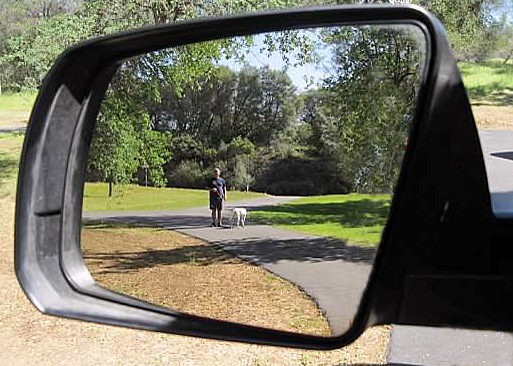 Looking in the side view mirror at Chris walking our dog. As mentioned in the prior blog post, the last photographic guideline that Jack spoke about during April’s meeting was framing within a photo. A frame can be anything–a doorway, a hole, branches of a tree–that helps draw your eye naturally to the subject you are photographing…the images you are viewing here. Since I am just beginning to develop a photographer’s eye, the photos I shot are somewhat dull, having used a subject who posed for me (a beautiful subject however, my sister Gracia). April 18, 2015. 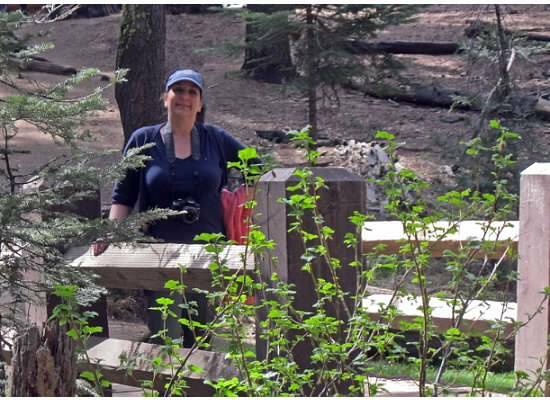 On a warm Saturday morning, Gracia and I drove to Yosemite National Park. My mission was to shoot photos that fulfilled the club assignment for May: framing a photo within the composition. 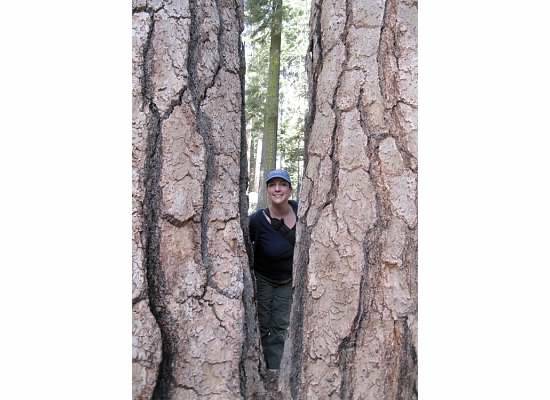 Our first stop was to Mariposa Grove where we had the opportunity to see some of the prominent trees before the grove closes in July for a 24-month restoration project. 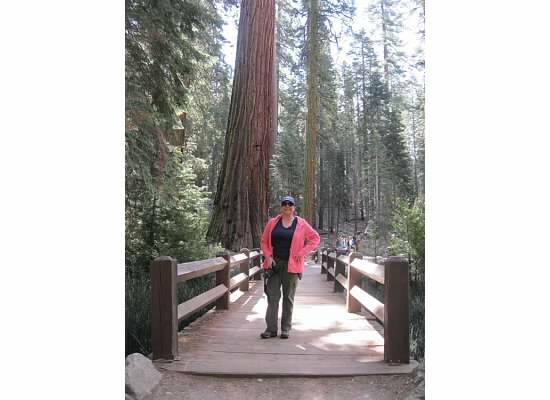 Gracia and I crossed the bridge and followed the throng of people through the forest of giant sequoias. 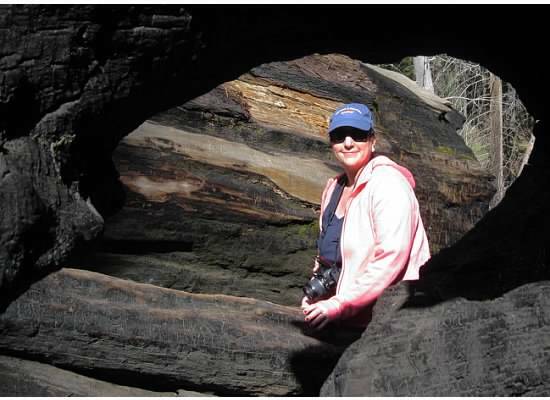 While sauntering along the path and looking for a frame within a frame photo op, we passed many trees that dwarfed us including the Fallen Monarch, the Bachelor and Three Graces, the Grizzly Giant and the California Tunnel Tree—a tree so large that a tunnel was cut through it. The tunnel was cut in 1895 and still drips sap. 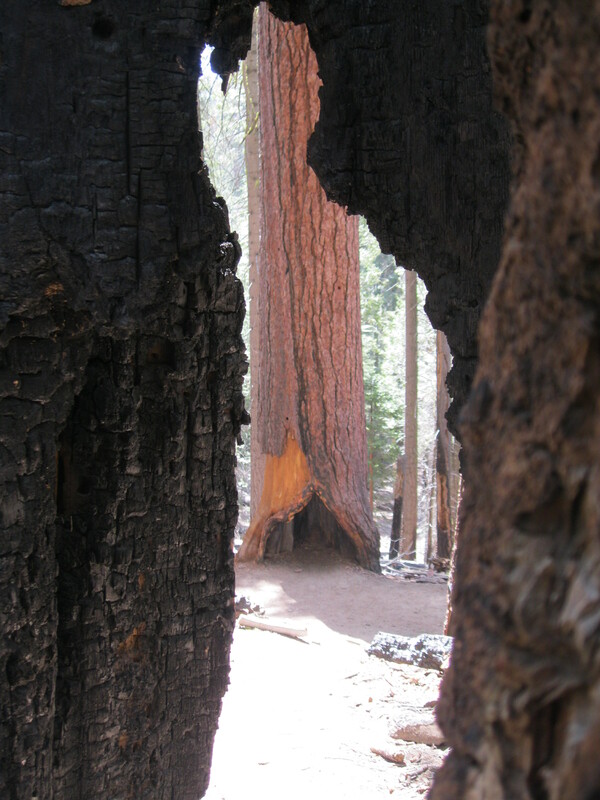 Looking through the burned bark of a tree at another tree across the trail. The crowd thinned beyond the tunnel tree. At a trailhead sign, we took a side path to see the Faithful Couple tree. We were surprised to have that whole section of trail to ourselves. Away from the noisy parking lot and the Saturday crowd, we were able to hear woodpeckers and stellars jays. We watched baby squirrels play in the branches of a sapling and spotted many bright red snow flowers. The path circled back to the car and we headed to our next destination: the Pioneer History Center. 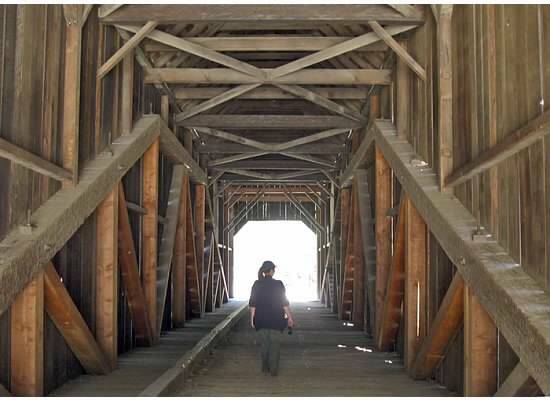 As often as I visit Yosemite, this was my first time walking through the covered bridge at the Pioneer History Center in Wawona. 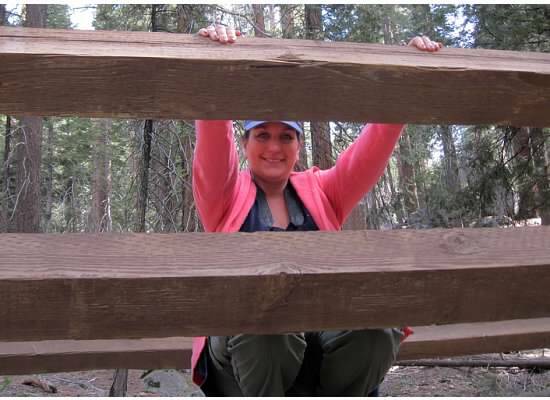 The bridge spans the South Fork of the Merced River and made for a good composition. No matter what angle I tried, I couldn’t change the bright light at the end of the bridge. I think it’s kind of intriguing though. 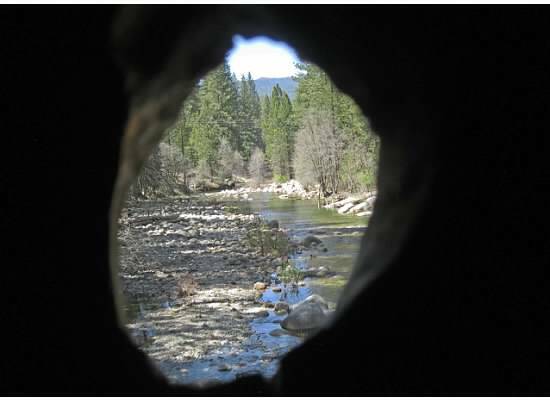 Looking through a knothole on the bridge. 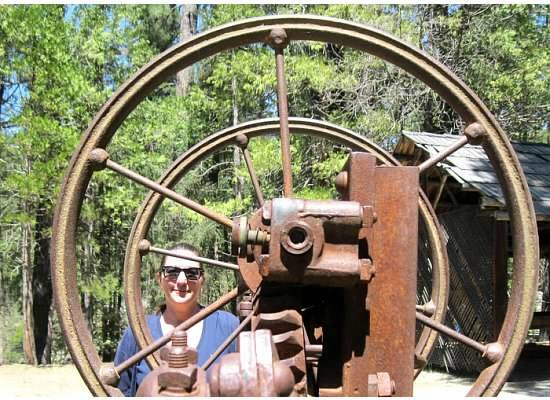 We toured the village of historic buildings that sat opposite the bridge, then wandered around looking at the rusted farm equipment. I felt satisfied with the photos I shot for the frame within a frame exercise. I don’t know if Gracia was tired of being the subject of many photographs, but she was a good sport seeing as I shot over twenty photos of her. Slowly I will gain confidence as a hobbyist photographer and will fine tune my eye to the world around me so that I don’t go for the obvious but see the natural. 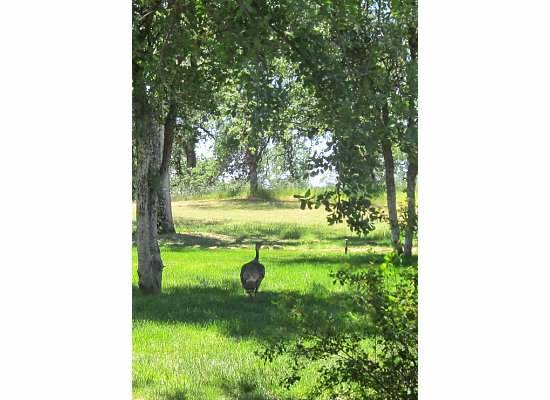 Driving up to my house, I spied a turkey in the front yard. Is this considered obvious or natural? 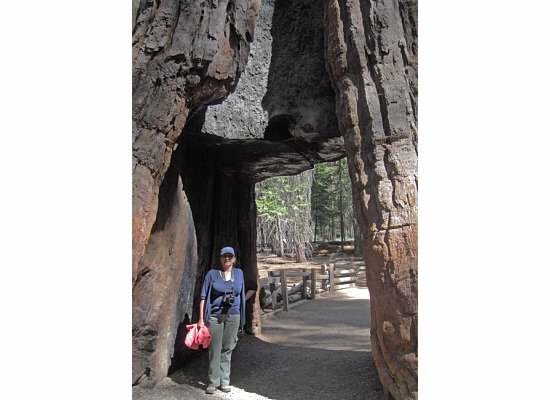 This entry was tagged California Tunnel Tree, Covered Bridge, Mariposa Grove, Photography, Pioneer History Center, Wawona Covered Bridge, Yosemite, Yosemite National Park. Bookmark the permalink. 🙂 Thank you Cathy. Your sailboat photo with the sun setting was a perfect example of a natural “framed” photo. I loved all the photos, particularly the burned tree ones. You don’t look like a “beginner” to me! 🙂 Thanks, Sheelah. There’s always so much to learn. This has to be one of the best blogs you’ve written! The photos were great and the “model” was great. I may be a tad bit biased, but still, WELL DONE! Yep, I did have a good model. Thanks, Dad. Most of the photos are nice but the last one is a real turkey.